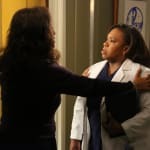 Grey's Anatomy Photo Gallery: "I Bet it Stung"
Grey's Anatomy airs its 200th episode event this Thursday night, October 10. 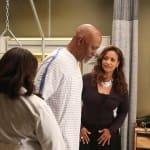 Follow the link for a promo and photos of that episode, "Puttin on the Ritz." 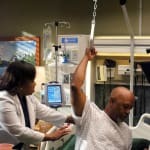 Looking ahead to the following week, Meredith struggles at balancing being both a mother and a surgeon in "I Bet It Stung." When she comes back to work, she realizes that having it all is a challenge. 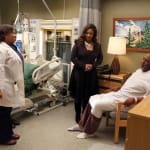 Meanwhile, Stephanie attempts to win over Jackson's mom, Owen and Callie must handle a situation with a patient that gets emotional, and Jo ends up getting too deeply involved with a patient. Your son is the devil's spawn. He drinks the milk of a liver thief. I don't ease back in. I jump in the deep end. I swim. Permalink: I don't ease back in. I jump in the deep end. I swim. Grey's Anatomy Round Table: "I Bet It Stung"
Grey's Anatomy Music: "I Bet It Stung"